Welcome to our selection of holiday rentals in Benagil. 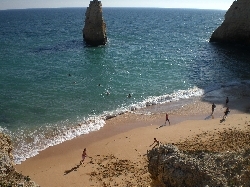 Benagil is an unspoilt fishing village on the south coast of western Algarve. It is wonderfully picturesque with a beautiful sight to be had wherever you are in the village. From the many beaches to the middle of the village or the surrounding countryside, you can enjoy your surroundings in peace and relaxation. The golden sandy beach is particularly stunning, sandwiched between clear blue waters and tall ochre cliffs; it�s easy to see why it�s so popular and the highlight of the village. Despite its amazing natural beauty, which attracts many visitors, Benagil is still a traditional village in nature with a few restaurants that serve quality fish and seafood, while the shops tend to be typically small. Benagil hasn't embraced tourism like other nearby towns and villages have done but this ensures that Benagil retains its personal characteristics that make it so well liked. Looking for self catering holiday accommodation in Benagil? Then below is a selection of holiday villas in Benagil and holiday apartments in Benagil that can be rented direct from their owners. You can either click on each listing for further details or you can use our search engine on the left if you are looking for something in particular.